Julianne Moore finally gets the recognition she deserves from the Academy with an attention grabbing performance that is sure to tug at the heart strings of audiences around the world. Alice Howland (Julianne Moore) is a happily married woman with three grown children and a successful career as a renowned linguistics professor. Soon after turning 50, Alice begins to forget words and decides to see a neurologist as her memory starts to decline in other ways. It starts with just missing a few words here and there, but then she starts to forget where she is, even on the campus where she works. Alice receives the devastating diagnosis that she has early onset Alzheimer’s disease and that her life, and that of her family, is about to rapidly and dramatically change. Alec Baldwin is the husband too wrapped up in his own work to even notice his wife’s struggle until Alice lets it all spill out one night. While Alice has to face no longer working, her husband John remains committed to his own career, testing their bond and making life more difficult for both of them. Alice’s grown children all have their own issues with eldest daughter Kate Bosworth trying to get pregnant and Kristen Stewart desperate to become an actress, much to her mother’s disapproval. 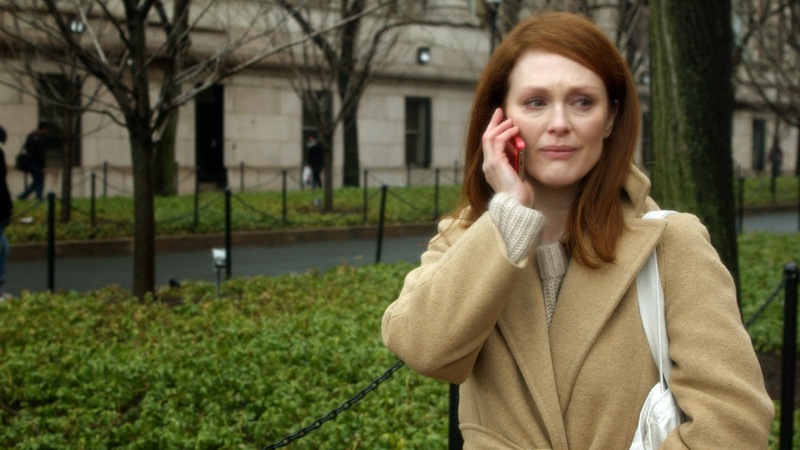 Based on the novel by Lisa Genova, Still Alice is a weepy, depressing film. Luckily, and ironically for a film called Still Alice, it barely stays still for a moment. Despite the slow, mournful soundtrack, Still Alice rushes through its story. Alice’s Alzheimer’s comes on rapidly, affecting her life and the life of her family quickly and viciously. It is a shame that there is not more time to get to know the characters of her kids as Bosworth, Stewart and Hunter Parrish in particular feel completely short changed by a script that barely explores their reaction to their mother’s illness. It’s an aggressive, destructive disease that not only eats at Alice’s mind, but also threatens to attack the three children. The inherited nature of the disease means that they all have a 50/50 chance of developing it also, and then on passing it on to their own children. However, this is only briefly alluded to and the focus remains very much on Moore’s central character. Alice is a fiercely intelligent woman who relishes her mind and finds the erosion of her cognitive capacity to be unbearable. Moore is an actress who often looks on the verge of crying anyway, but Still Alice gives her the opportunity to really give those tear ducts a workout. At times trying desperately to appear normal and happy for her children and at others, letting all her emotions loose, Moore unsurprisingly delivers on all fronts. Seeing her transformation from remarkable and vivacious career woman to tragic victim hits home most notably in the scene when her old self comes face to face with the woman she has become. Before succumbing to the disease, Alice makes a video for herself to watch in the future, and this moment really brings home just how much she has changed. At forty minutes into the film, this is Alice making a tragic, life-altering decision that will leave audiences feeling defeated and hopeless. It’s a brave or cowardly choice from Alice, depending on your viewpoint, but it also lends the rest of the film a terrible inevitability. It is clear that there is no way that Sill Alice can have a happy ending, no matter what the outcome is. Though there are occasional moments of happiness, the score is all heartbreaking stings and melancholy piano. Directors Richard Glatzer and Wash Westmoreland aren’t letting anyone off easily when watching this story full of despair. They plant us in the headspace of Alice with her surroundings often out of focus , reflecting the confusion and distance she begins to feel, even in the most familiar of surroundings. They use Moore’s face continuously to reveal the inner torment that she feels as her memory deteriorates. On the one hand, there is some respite from the misery in knowing that she lived a full life and got to watch her children grow up, but on the other, the irony that such an intelligent woman, so passionate about words and communication is now starting to lose her ability to speak is all the more tragic. When Alice sums up living with her disease in an impassioned speech to the Alzheimer’s Association, it is a rare moment of triumph in a film that does not deal in joy and overcoming adversity. Still Alice is a film about loss, about perceptions of people suffering from Alzheimer’s and about the effects it has on the victims and (to a far lesser extent) those around them. Despite Moore’s excellent performance, Bosworth, Stewart and Baldwin could have been given more to do by a script that should have spent more time exploring the effects on those around Alice.